Dental educators, state and federal agency representatives, and individuals from health care organizations gathered together on Aug. 30 for the Dental Schools Addiction Education Summit (Summit) for Substance Abuse and Mental Health Services Administration’s (SAMHSA) Regions III and IV. 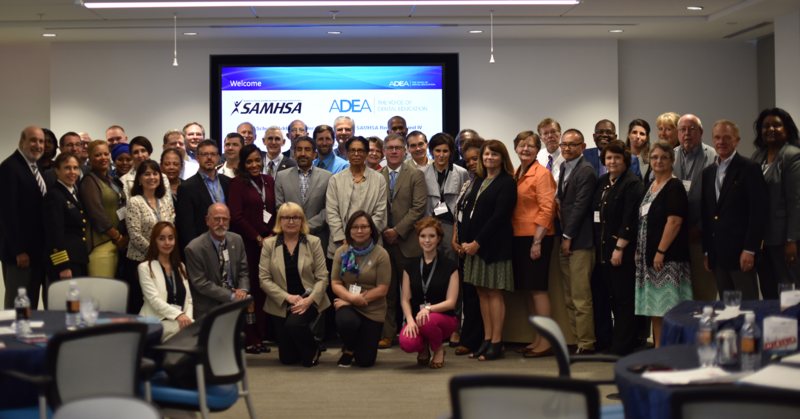 SAMHSA, in conjunction with ADEA, conducted the meeting. Representatives from dental schools in 11 states and the District of Columbia, located in SAMHSA’s Regions III and IV, attended the meeting. The Summit’s goals were to provide information about the opioid crisis and encourage a dialogue among participants to share ideas and develop plans for future engagement and collaboration. The Summit provided a mix of educational information and interactive sessions. Attendees heard presentations about the importance of training prescribers in the prevention of substance abuse, the Massachusetts dental education core competencies for the prevention and management of prescription drug misuse, and the perspective of a dentist who eliminated opioid prescribing after surgery in his practice. Representatives from each dental school reported on their schools’ current activities to address the opioid crisis. State and federal agency representatives, and staff members from the American Dental Association (ADA) and the Association of American Medical Colleges (AAMC), also shared information and resources. The participants, grouped by state, broke into small groups and each identified one idea they wanted to implement, resources needed and next action steps they planned to take.